It is no small task to tell the story of how the nation arrived at this moment of extreme concentration of wealth and political power. It’s even more difficult to explain what, specifically, can be done to reclaim the economy and democracy for the benefit of the public. But the Roosevelt Institute has attempted to do just that with its new report, “New Rules for the 21st Century: Corporate Power, Public Power and the Future of the American Economy.” It is a report, ultimately, about power—who has it, who should have it, and what hangs in the balance as the fight for power is waged. The report’s authors argue that in order to create an agenda that will both respond to the demands of this political moment and also gain public support, one must first accurately diagnose and effectively communicate what brought us here. Over the past 50 years, according to the report, free marketeers—including neoliberal policy-makers who believe that free markets produce just outcomes—created today’s inequities in wealth, opportunity, and power through a “calculated one-two punch.” The first punch concentrated corporate power through “regulatory, tax, and procurement” policies that allowed financial and political elites to reap the benefits of a very intentionally designed system. The second punch weakened public power by framing government spending as “inherently inefficient” in contrast to a “free market” that was fair, neutral, and rewarded a “pull yourself up by your bootstraps” work ethic. To sell the first set of policies, the public was told that by reducing top marginal tax rates and taxes on capital gains, deregulating corporations, weakening unions, and generally doing whatever is possible to create unfettered markets, we would all share in the wealth through job creation, higher wages, and increased opportunity. (In other words, that wealth would “trickle down.”) The result? The top .01 percent (about 200,000 households) now own the same wealth as the bottom 90 percent of all Americans while wages have remained fairly flat since the 1970s and the racial wealth gap has widened. Moreover, with the injection of more money in politics through campaign contributions and federal lobbying ($3.5 billion annually), financial elites have increased their access to policy-makers and consequent ability to write rules that buoy the continued concentration of wealth and power. Key to the strategy of the second punch, as report coauthor and Roosevelt fellow Darrick Hamilton noted, was employing dog-whistle politics to portray those who benefited from public spending as black and brown people who were “lazy, unvirtuous and underserving welfare queens.” Spending on public programs was rolled back—the US now ranks 10th lowest of 38 industrialized nations on social expenditures as a percentage of GDP—and as trust in government eroded, power was ceded to the private sector in the form of subsidies, tax credits, contracting, and more. We see the results throughout our economy and society—in the privatization of prisons and immigration-detention centers, core defense services, and janitorial and clerical staff at federal agencies; crumbling infrastructure; a lack of access to essential services like childcare, health care, and higher education; and constant attacks on a public sector that used to be a source of good jobs and opportunities for marginalized communities. The report argues that progressives (and small-d democrats) must counter with a one-two punch of their own in order to course-correct our politics and build a more inclusive, dynamic economy—first, curbing corporate economic and political power; and second, reimagining the ways that public power can be used to serve public interests. Some of the ideas around limiting corporate power are fairly intuitive, including “enhanced antitrust enforcement, higher taxes on wealth and excess income, corporate governance reform, and more expansive labor laws.” The report calls for reforms like curbing or banning stock buybacks so that profits are reinvested in workers; a new standard for merger review that considers risks of consolidation to suppliers and workers; making unionization and bargaining easier, including through default unionization unless a majority votes otherwise; adding workers and other non-shareholder stakeholders to corporate boards; and breaking up “too big to fail” financial institutions. One proposal for curbing corporate influence is to empower small campaign donors by providing public funds to candidates who reach a certain threshold. Critically, this approach would enable more working-class people—who currently represent less than 2 percent of federal legislators—to run for office. The report notes that our current system results in Congress spending “only 1 to 2 percent of its time on poverty-related matters,” and generally being quite uninformed about how their decisions impact people in poverty. Other key voting reforms include a new Voting Rights Act to counter voter suppression and gerrymandering, both of which dilute the voice of those suffering under our corporatized government. 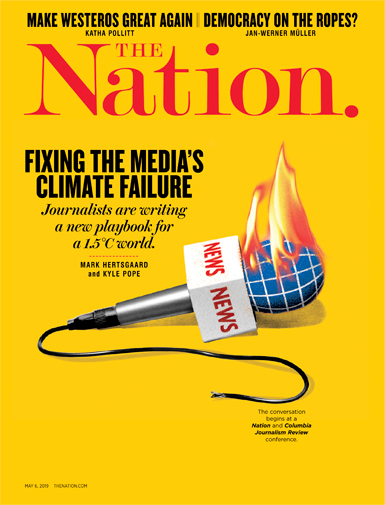 The coauthors also call for ensuring voting representation in Congress for nearly 6 million Americans in Washington, DC, and in Puerto Rico and other US overseas territories, and at-large House and Senate seats for Native Americans to begin to make amends for treaty violations. Donald Trump certainly recognizes the urgency people feel for a new approach to our economy and governing. He exploits it by blaming immigrants, stoking white fear, and employing a 24-7 fact-free propaganda campaign. Stacey Abrams offered a counter-approach: “You can have conversations with everyone. 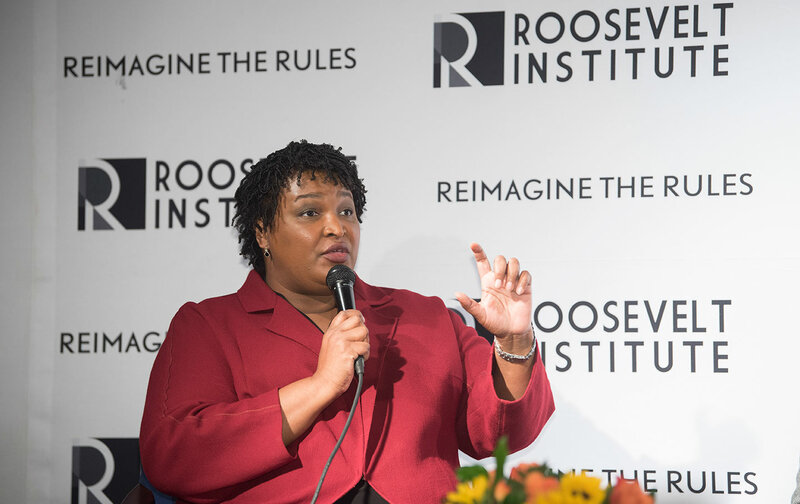 You can tell a common story but still see the differences.” Abrams said that when she ran for governor in Georgia in 2018 she talked about language barriers facing Latinos, access barriers for people with disabilities, workplace protections needed for LGBT people, health and incarceration disparities for African Americans, and the loss of hospitals for rural white people because the state refused to expand Medicaid. Abrams did it by telling a story of economic opportunity and public power that countered the now-exposed false narrative that people get what they deserve in our so-called free-market economy. She ran fearlessly, listening to people’s struggles, diagnosing why those struggles exist, and telling them what she would do about it. That fearless approach to running and truth-telling is one that more progressives and small-d democrats need to embrace. The Roosevelt Institute has offered a resource that should help any candidate who wants to stop treating issues as siloed and unrelated, and instead confront the root problem of concentrated wealth and political power. It’s a unifying story that needs to be told over and over again, along with an inspiring and achievable plan of what can come next.